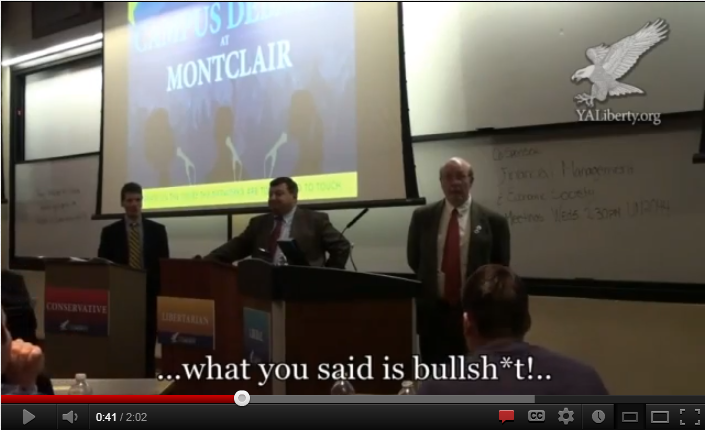 A shocking video from a campus debate hosted by Young Americans for Liberty (YAL) reveals Montclair State University professor Dr. Grover Furr adamantly denies any wrongdoing on behalf of communists throughout history, including the genocidal leaders of the Soviet Union. In the face of persistent student questioning, Furr maintained that "Stalin did not commit one crime." I often hear reports of Marxist college professors teaching students, but rarely am I so shocked as I am by Dr. Furr`s remarks, " said Jeff Frazee, YAL`s Executive Director. "The suggestion that Joseph Stalin, one of the most brutal mass murderers in history, didn`t commit any crimes is outrageous. This is what is being taught at a public university with taxpayer money!" Claiming it was "bullsh-t" that communist regimes had committed any crimes, Furr also insisted that the United States has the lowest standard of living of any industrialized country. His comments were predominantly met with boos from the student audience. Furr is a professor of English at Montclair State University in New Jersey. Young Americans for Liberty is the largest, most active, and fastest growing libertarian and conservative organization on America`s college campuses, with a network of more than 125,000 members and 380 chapters nationwide. YAL seeks to identify, educate, train, and mobilize students on the ideals of individual liberty and the U.S. Constitution. Learn more at www.YALiberty.org.